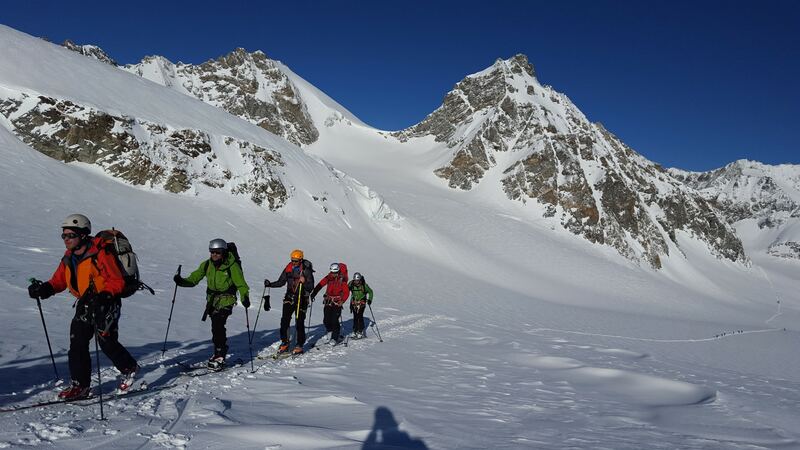 An unforgettable ski touring week from Chamonix to Zermatt across the famous Haute Route in the Alps. Do it under the supervision of Martin, an IFMGA certified mountain guide. The crossing from Chamonix to Zermatt by skis is an experience that every skier has to do once in his/her life. There are few places in the world where skiers can travel freely to the middle of the mountains, through high slopes, immense glaciers and remote valleys. And the Haute Route from Chamonix to Zermatt is one of them. We will spend 7 unforgettable days in the mountains although the round trip will take us 9 days. Our starting point will be in Chamonix. I can take with me 2 participants as maximum. 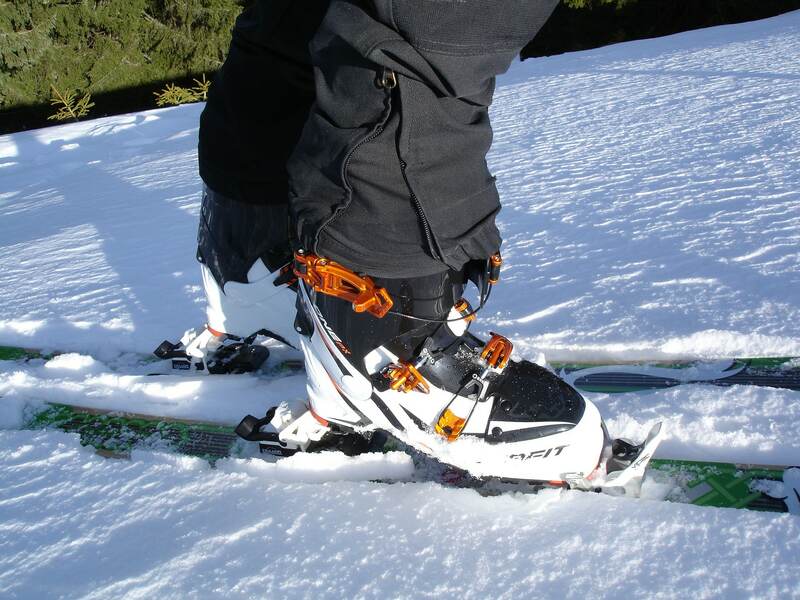 Remember you must have a good prior experience in ski touring and splitboarding. A good fitness level is also mandatory. 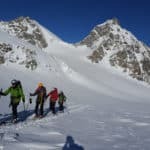 As for the accommodation, the extensive network of alpine huts along the Haute Route allows us to enjoy the best skiing and then, sleep in a different mountain lodge every night, changing the scenery through the window. The Haute Route, joining two mythical mountaineering places, offers a unique experience to each skier. And you cannot miss it if you’re planning to come to the Alps. Contact me for further information or if you want to book your place now. 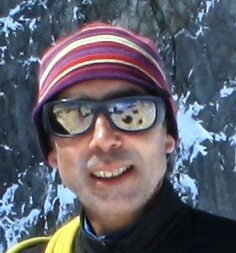 I’ll be glad to be your guide in this amazing ski touring program. Group reception in Chamonix in the afternoon. Revision of equipment and material. Ski day at Grands Monttets station. Practices with Arva and hostel night in Chamonix. Taking the cable car in Argentiere. From Grands Monttets, descent to the glacier of Argentière and, by the Col de Passon and Col Sup of Tour, we’ll finally get to our next accommodation: the Trient Hut. We’ll cross the Col des Ecandies and get off at Champex. From Champex we will follow the Verbier by a taxi-van. 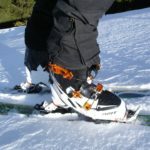 Ride on the cable cars, then ski down and finally we will arrive at the Mont Fort Hut, where we will spend the night. Afternoon free to ski or rest. We’ll put our skins on to leave the station and ascend to the top of Rosablanche. From here we’ll have a short but elegant descent to the Prafleuri mountain hut. From the Prafleuri refuge to the Dix hut, crossing the huge Dix reservoir. From the Dix hut, we will ascend the Serpentine pass to the Pigne d ‘Arolla. It’s the highest summit of the tour. We will then arrive quickly in a memorable descent to the cabin of Vignettes. A great day of skiing to Zermatt. First we will cross with skis the Col d’Evêque, then with crampons and the skis in the backpack, the Col du Mont Brulé. Finally, we’ll reach the Col de Valpelline. From here, we will have the great descent of 2000m of vertical drop through the Stockli Glacier to Zermatt. Transfer to Chamonix by taxi and overnight stay at the hostel in the city. Trient Hut, Mont Fort Hut, Prafleuri hut, Dix hut and Vignettes hut.